wimbledon starts next monday. wimbledon thinks they’re so awesome, but they’ve got a lot to prove to me this year. first of all, the french open was too cool. that’s a hard act to follow. remember how all the americans were out after the first round and how all the american sports media mostly wrote articles about that? remember how rafael nadal beat roger federer less than a month after federer ended nadal’s 81-game clay court winning streak? remember how hawk-eye (aka spot shot) doesn’t even work? i don’t remember that, but brian told me and i believed him. recently brian wrote an article about how federer probably wouldn’t pose like nadal did after winning the french open. well, i think wimbledon’s worse i found a picture to back me up. but still, tennis is great to watch. 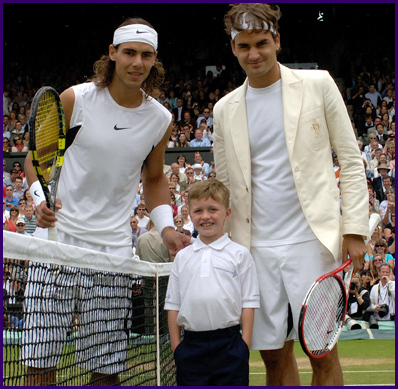 even if every player has to wear white for wimbledon. grass is federer’s surface of choice and although he has looked vulnerable a lot this year, he’s tough to beat on grass. then there’s nadal. he’s not the best grass player, but he’s good enough to make it to the finals and make federer earn it. or maybe andy roddick will do really well. he just won his first grass tournament last week and has looked good this year even though he lost bad in the french open. i wish he was making those lexus commercials. then i could love him. physical love. oh yeah, there’s other tennis players too, but i don’t want to look up how to spell djokavic and youznhy. i hope roddick goes bald. i hate that guy.